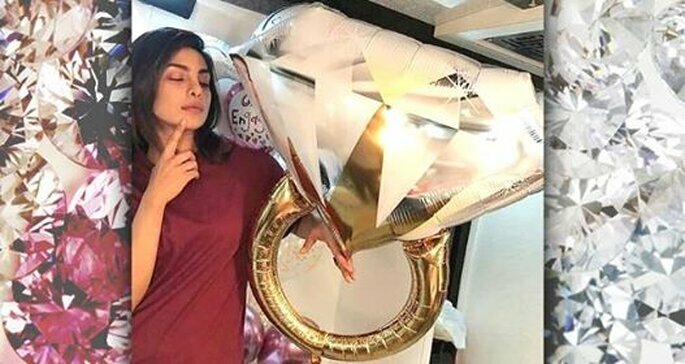 We reported the news that actress Priyanka Chopra and musician Nick Jonas were reportedly engaged nearly a month ago – and this weekend we got official confirmation from the couple themselves that they are getting married! Ending weeks of speculation, the two announced the news on Instagram by posting the same photo: the two of them gazing dreamily into one anothers’ eyes, in an intimate moment that we did not expect from this notoriously private and lowkey couple! As if they couldn’t be more of a perfect couple! However, this was not the end of Priyanka and Nick’s announcement. Whilst in India, the pair participated in the traditional Roka ceremony – this does not have a Western equivalent, but is considered in India to be the “first step” towards marriage. The couple, wearing traditional outfits, are accompanied by their families, who meet and give each other gifts to celebrate the union, and receive a blessing from a holy priest. The puja – a beautiful Hindu prayer ritual – was also performed at the Roka ceremony, which was then followed by a party. After the Roka and party – where we saw some great videos of Priyanka dancing! – the pair rounded off their trip to India by visiting St Catherine’s Home for Orphans in Mumbai, an orphanage that Priyanka has been a patron of for nearly 12 years now. It is clear to us that this couple is not going to allow themselves to be distracted from the social issues and charities they think are important! Nick and Priyanka have since returned to the US from India, but we imagine it might be a little while before we find out any of the details of the big day itself. We can only imagine just how amazing the ceremony is going to be, particularly if they decide to have it in India, where weddings are often 2-3 days long, and incredible celebrations of love. We at Zankyou would just like to say congratulations to the happy couple on their engagement, and a lifetime of happiness together!